For my digital collage project I wanted my collage to look like it was edited in photoshop rather than a more realistic approach. While working on this project I was back home with my nephew and he inspired me to make the collage have a childlike feel to it. All the images i used were from primary search engines with public domain sites such as Bing and Google. Wanting that child friendly feel to it i made sure that the pictures i pulled from the internet were colorful and and all different things that kids enjoy. While creating this collage i started it with the young boy whom reminded me of my nephew. He has such a large smile in this image its almost hard not to smile back creating the emotion i wanted from the audience. I began asking my nephew what his favorite toy was and he said an airplane and his pikachu so i then decided to incorporate those in my image. I then began thinking back to when i was a child and how my brother and i used to catch caterpillars and bring them home to our nanny. The next image that came to mind was a giant lollipop because what little kid doesn’t like a giant lollipop? I also included my favorite flower the sunflower, Sunflowers are large, bright, and absolutely beautiful when in full bloom. The background of this collage is a rainbow with a man at the end and raising his hands in the air. While first assembling i wasn’t sure i wanted to include the man or just cover him up with another image. As i played around with the occupancy of the lollipop i decided it looked more interesting when you can see the man very subtly through the lollipop. I hope when people look at this collage they begin to think back to their childhood and what they used to play with as kid. 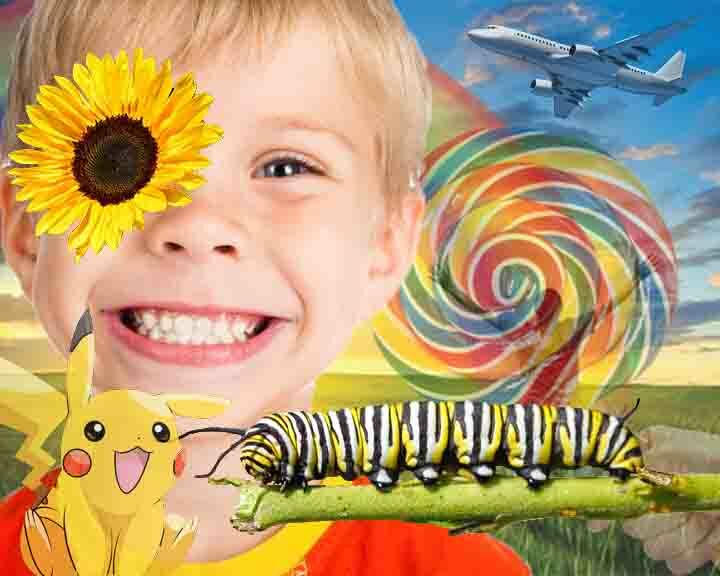 There is so much going on in this image that your eye jumps all over the place almost not sure what to look at and i did this because it made me think about children minds and how they are constantly thinking about 1000 different things at once. I also hope the audience recognize how colorful these images are and almost all of them including a yellow. Yellow is color in which brings hope, happiness, remembrance, and optimism which is exactly the emotion the audience should feel when looking at this collage.